HCM CITY — Farmers in the Cửu Long (Mekong) Delta province of An Giang switched to growing other crops on 20,000ha of paddy fields during the 2017-18 winter-spring crop, earning big profits and managing to cope with climate change. The fields are mostly in mountainous areas, and thus far from irrigation sources or infertile. They grew soy bean, honeydew melon, corn, red chili, vegetables and other crops. Phạm Công Tạo, one such farmer in Tân Châu District’s Phú Lộc Commune, grew oriental onion in his 4,000 sq.m field and earned a profit of around VNĐ80 million (US$3,500) per crop. The production cost of planting the onion is higher than rice, but the profits from it are four to six times higher than from rice, he said. Besides, the switch saves him plenty of water and he does not have to worry about drought, he said. His field is situated in an area of the commune earmarked for growing vegetables and other crops, which has good roads enabling easy transport of the produce. In any case, traders come to his farm to buy and harvest the oriental onion by themselves, he said. Many farmers in Phú Tân District’s Tân Trung Commune are harvesting soybean and reaping a bumper harvest. The commune’s safe vegetable co-operative team planted 45ha of soybean in the 2017-18 winter-spring crop and has harvested 38ha so far. Nguyễn Văn Minh, one of the co-operative team members, said he has been instructed in soybean farming by the commune Farmers Association and the Phú Tân District Agriculture and Rural Development Bureau. His 22,000sq.m soybean field yielded a profit of VNĐ150 million ($6,600) in the 2017-18 winter-spring crop, he said. Võ Chí Tâm, chairman of the Farmers Association, said to restructure agriculture local authorities have supported farmers in their switch to other crops in recent years. Many farmers in the commune have shifted to soybean, he said. Trần Anh Thư, director of the province Department of Agriculture and Rural Development, said the province has been encouraging farmers to grow other crops on infertile rice fields. 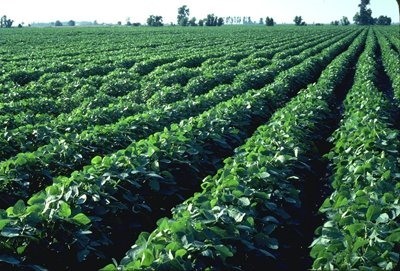 Growing sesame, green bean, corn, soybean, and certain other crops enables farmers to adapt to climate change and ensures a big profit, he said. An Giang plans to have 40,000ha of specialised areas in its city and every district and town for growing vegetables and other crops by 2030. It plans to develop those areas through a co-operation model to guarantee outlets for farmers and ensure they use advanced farming techniques. It also plans to improve the quality of co-operatives and co-operative teams in the specialised areas, and prioritise roads and irrigation facilities there. It will increase the use of advanced techniques such as automatic irrigation in net houses in those areas, with the crops grown to Vietnamese good agricultural practices standards.